Fishing continues as the summer draws on, long sunny days and nice conditions continue which fuels the desire for many too fish. Backcountry has been solid all year and some trout are in outstanding condition after months of low conditionsÂ andÂ good insect life. The lack of high water or floods this season has really set the scene for some memorable fishing and the fish have thrived in the good conditions. 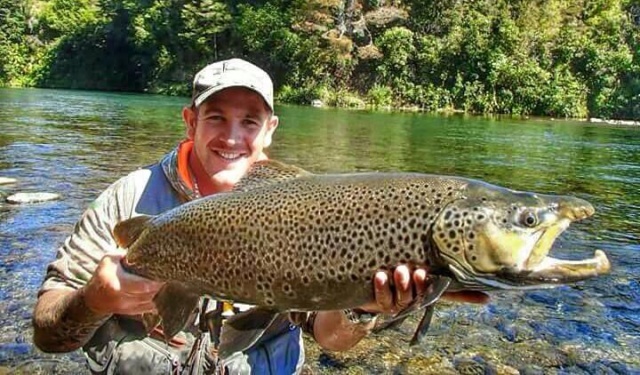 I fished the headwaters of the Whanganui during the week after a long ride in on the quad bikes and was blessed with trout in every pool we fished. With so many pools to get through we decided to catch a fish per pool and move on , this being achieved most of the time in the first three casts. In many ways it was outstanding fishing but I was very surprised not to get any takers on the dry , everything was deep and on the nymph. In saying that Cicadas seem to have died their death and the forest was pretty quiet. A good selection of brown and rainbow trout were caught with a solid average of 3lb, amazing wild fishery. Locally has been ticking over nicely with the lake again producing some amazing results. Fish in Taupo this season are in good condition and have that lovely fat on their stomach which makes for great smoking. There are some good fish moving through the rivers both rainbows and browns. I think we might have had some early running rainbows as I have seen some quite large fish both caught and laying deep in sandy pools, maybe that bit of rain pushed the odd one through. Brown trout seem to be the feature for many and they are being seen in plenty of different rivers and bays of the lake. Â There are plenty of websites about writing of trophy trout everywhere , lets remember what we consider a trophy -10lb plus??? Seems the NZ standardÂ for wild fish? There are no more browns about than any other season, unfortunately habitat has been getting destroyed and fish are moving into pools which anglers are fishing more often. For example the lower river on the Tongariro is a disgrace after the work was done by altering the natural river and removal of willow trees-thus being where browns once hung out. They are now pushed into the middle reaches and visable for those who wear polaroids. Seeing them is one thing and catching certainly is another , keep at them they are catchable during the entire day but patience certainly helps. Last week I was lucky enough to land a fish over 14 lb. I happened to be guiding that day but my client asked me to fish at this monster as he had never fished before as he was worried about spooking it. I grabbed the rod with both hands and took the opportunity which after a few good casts a fly change and 25 nervous minutes we landed one big fish. I have never seen a fish of this size, let alone caught one so it was a special buzz which I will remember for some time.Â The sheer thickness of this fish was amazing, awesome spots, thick paddle and a huge jack jaw. It will be mounted and displayed in Rod n Tackle- a true trophy indeed. Hope you are getting out there and enjoying the day, winter will be here soon and a new scene of fishing will soon appear.